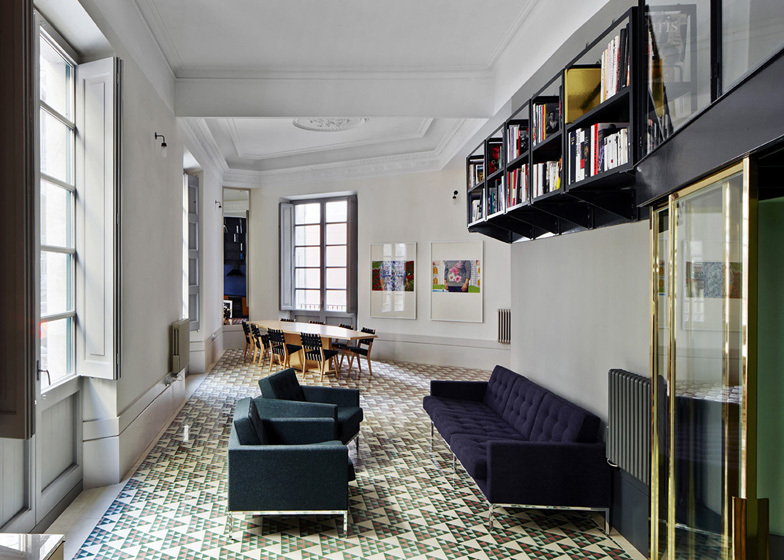 Inside Festival 2013: a Barcelona apartment renovation with triangular patterned floor tiles has been named World Interior of the Year at the Inside Festival in Singapore. The floor of the Carrer Avinyó apartment by London studio David Kohn Architects is covered in triangular tiles that gradually change colour from green to red across the space. The architects designed the apartment as a holiday home for two brothers who live in Hong Kong. They removed the internal partitions to form a large living area and restored the original ceiling mouldings - read our full story about the project here. We recently featured the interior in a roundup of tiled Barcelona apartments, which we've published a few of this year. After the announcement David Kohn commented: "We are absolutely delighted to have won the award. The project demonstrates how an interior can be about the city in which it is situated. An homage to Barcelona." "The project has a quality we set out to find today, that is the quality of magic," said Inside Awards head judge Nigel Coates at the awards ceremony. "Spanning extremes of scale, it has become a suitcase you can sleep in but also a place for celebration and entertainment. The newly achieved large central room combines simplicity with a sense of space that stimulates curiosity." Winning the Residential category at the awards yesterday, the project triumphed over the other category winners at the Inside Awards, revealed yesterday and the day before. Inside Festival is held every two years and in 2011 the World Interior of the Year accolade went to The Waterhouse at South Bund hotel in Shanghai by Chinese studio Neri&Hu. Check out our interview with Lyndon Neri after the announcement. The festival is being held alongside the World Architecture Festival for the first time this year and Dezeen is media partner for both events, which conclude today. The World Building of the Year at WAF was awarded to the Auckland Art Gallery in New Zealand. Photography is by Jose Hevia Blach.